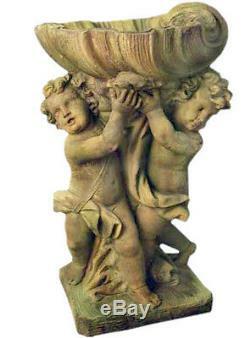 Cherubs with Shell Garden Birdbath 36" Product Code: F1154 Dimensions: 23"Wide x 20 x 36"High (58 cm x 51 cm x 91 cm) Made of Fibersone Cherubs with Shell Garden Birdbath 36" Made of fiberstone. Fiberstone is a mixture of sand and stones cast into the surface using terrazzo-like techniques. The surface is then sandblasted and chemically treated, and then hand painted with an antique acid stain to give the appearance of aged stone. Since it is reinforced with a fiberglass backing, it remains less fragile and lighter alternative to concrete and cast stone. By mastering the art of casting our products in fiberglass we manage to retain all the detail or the original with the added benefits of less weight, greater strength, and product suitability for both indoor and outdoor use. The advantages of fiberstone and fiberglass when compared to concrete, cast stone, and cement are that they are about half the weight, are far less fragile, and much more resistant. Also, Fiberstone sculptures and architectural elements are weather resistant and can be safely displayed both indoor and outdoor in your garden, when coated with your choice of one of our outside grade color finishes. This sculpture can be displayed both indoor and outdoor in your garden year round. THIS ITEM IS BRAND NEW! Please note that you will need to present a proof of the damage emailing us pictures is acceptable. Visit our store for more great products! Feel free to ask any questions you may have. The item "Cherubs with Shell Garden Birdbath 36" is in sale since Wednesday, March 27, 2019. This item is in the category "Art\Art Sculptures". The seller is "sculpture_collection" and is located in US. This item can be shipped to United States, Canada, United Kingdom, Denmark, Romania, Slovakia, Bulgaria, Czech republic, Finland, Hungary, Latvia, Lithuania, Malta, Estonia, Australia, Greece, Portugal, Cyprus, Slovenia, Japan, Sweden, South Korea, Indonesia, Taiwan, South africa, Thailand, Belgium, France, Hong Kong, Ireland, Netherlands, Poland, Spain, Italy, Germany, Austria, Bahamas, Israel, Mexico, New Zealand, Philippines, Singapore, Norway, Saudi arabia, Ukraine, United arab emirates, Qatar, Kuwait, Bahrain, Croatia, Malaysia, Chile, Colombia, Costa rica, Panama, Trinidad and tobago, Guatemala, Honduras, Jamaica, Antigua and barbuda, Aruba, Belize, Dominica, Grenada, Saint kitts and nevis, Saint lucia, Montserrat, Turks and caicos islands, Barbados, Bangladesh, Bermuda, Brunei darussalam, Bolivia, Ecuador, Egypt, French guiana, Guernsey, Gibraltar, Guadeloupe, Iceland, Jersey, Jordan, Cambodia, Cayman islands, Liechtenstein, Sri lanka, Luxembourg, Monaco, Macao, Martinique, Maldives, Nicaragua, Oman, Peru, Pakistan, Paraguay, Reunion, Viet nam, Uruguay.